Phuket has a huge variety of dive sites within reach of a day trip and there’s something for everyone. From the easy relaxed reefs at the Racha Islands to the King Cruiser Wreck and the soft corals at Shark Point, you’ll find every dive offers something different. We work with several boats and thus can easily tailor make a package for you with all the best dive sites whenever you want to go. 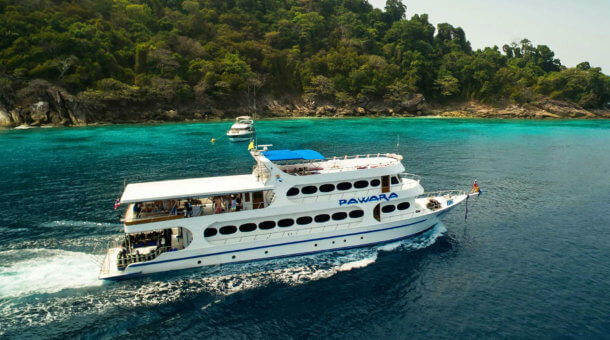 We work with various Phuket boat operators to ensure we can offer just about any dive site on any day. Please take a look at your options and contact us with your day trip wish list! Rather than restrictive fixed packages, we prefer to allow you to pick any trips you want .. from November – April during the high season all dive sites including the Similan islands are possible. 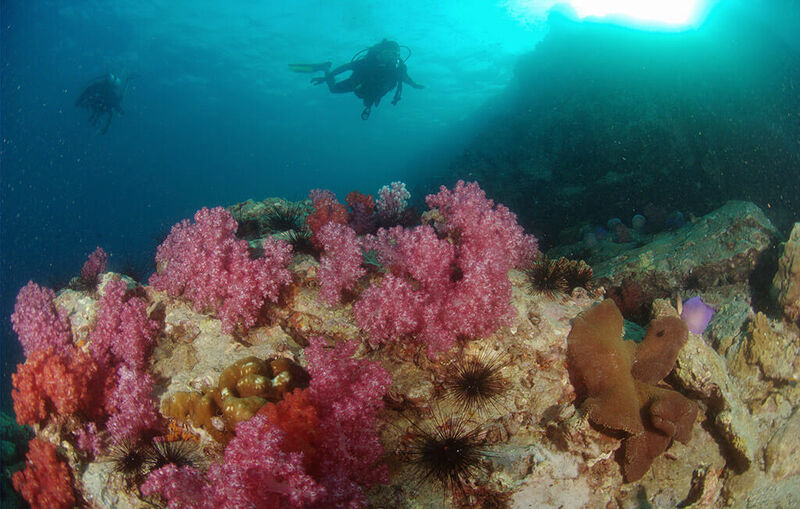 In low season (May – October) all local dive sites are still dived daily but the Similan islands are closed and local boat schedules may vary. If you book 3 day trips, discount is 5%. if you book 4 or 5 day trips, discount is 7.5%. If you book 6 or more day trips, discount is 10%. If you have made a PADI course with us at any time in the past, equipment rental is free for you also. All Phuket diving tour prices below exclude equipment rental and any applicable national park fees. All trips have free hotel transfers from Patong, Karon or Kata beach areas in Phuket. All trips include breakfast, lunch, drinking water, coffee, tea. Diving is in small groups. Sometimes you will dive with a diveguide who works directly for the boat operator. If you book 2 or more people we will often be able send our own dive guide, except for Similan day trips where all diving is led by divemasters who work directly for the Similan day trip operator unless you wish to pay extra for a separate divemaster – this is due to the expense and logistics of Similan day trips. If you book as a single diver and want 1 : 1 guiding this is available at an extra fee. Equipment rental (BCD/regulator/wetsuit/fins/mask) 500 THB/day. Dive computer rental extra 250 THB/day. Dive insurance extra 250 THB/day. Similan Islands Park fees 700 THB payable in cash on the Similan daytrip. Phi Phi park fee 600 THB payable in cash for Phi Phi day trips. If you’re booking a liveaboard and want a bit more diving, a day trip or two is a great option as an add on. 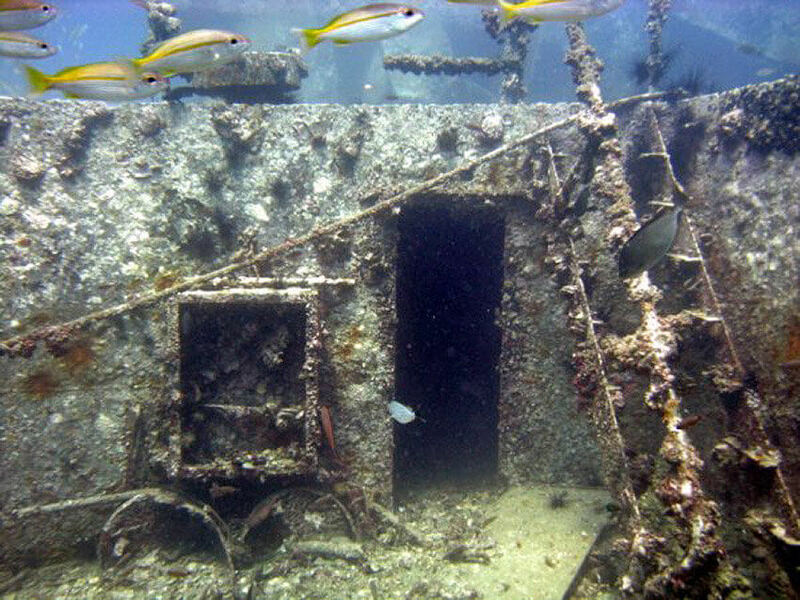 If you do book a liveaboard we give 10% discount on any day trip booked in addition to the liveaboard. You may also want to check a Similan Islands overnight or 2 night trips. A great compromise if you want more than just a day trip, but don’t want a long liveaboard. Please note – We do suggest booking in advance to ensure you get the trips you want on the days you want. If you are already in Phuket and want to do some day trip diving, please do call us (+66 84 626 4646) or visit our shop at Karon beach for booking. Yes, we answer email / web enquiries quite fast, but for last minute booking, better to talk to us in person! This trip is available any day 3,600 Baht. Easy diving, we also use Racha Yai for beginners dive courses. Also available any day 3,990 Baht. Good for all levels of diver. Available on Monday, Tuesday, Wednesday, Friday, Sunday 3,990 Baht. Schedules vary between seasons. Good for all levels of diver, but please note we cannot take non certified divers. Available any day 3,990 Baht. You should ideally be Advanced Open Water certified for this trip. The Similan Islands are just about within reach of a day trip from Phuket. 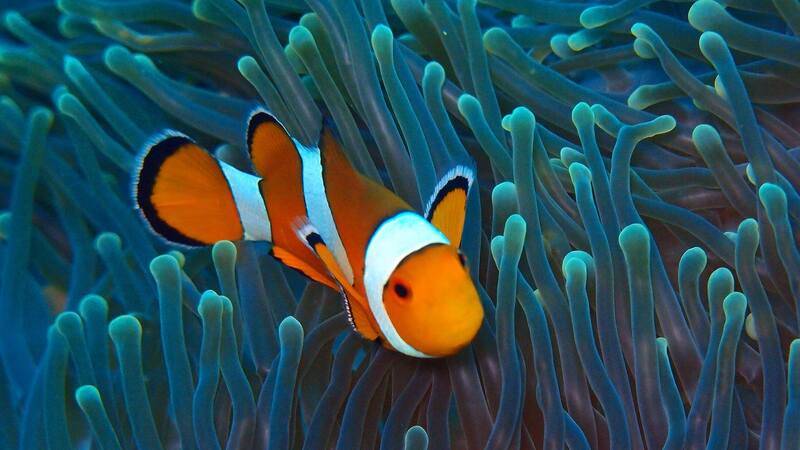 The Similans offer so many dive site options that a day trip gives you a mere sniff of what’s possible. 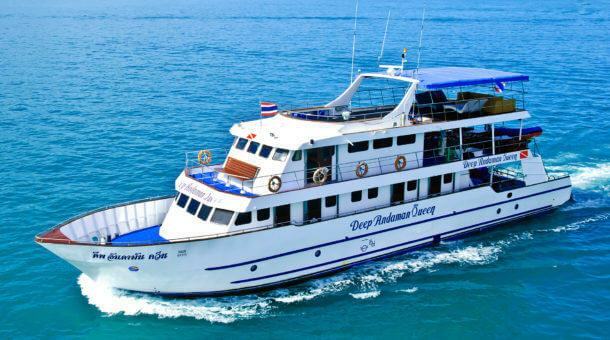 If you have time, a liveaboard is a very good idea to get the best out of the best diving in Thailand. 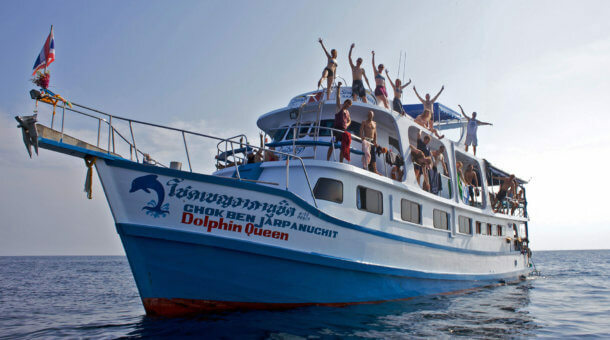 Most liveaboards run trips of about 4 days to the Similan islands. 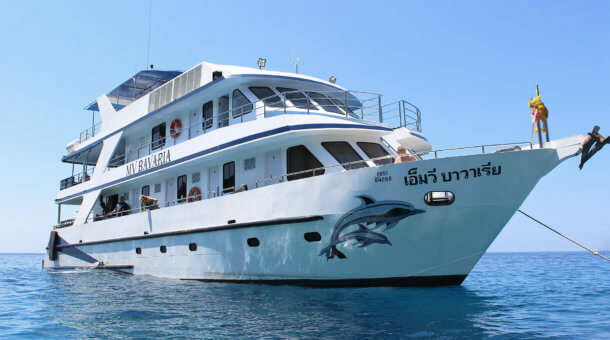 If you have less time, the South Siam liveaboard offers overnight stays or 2 night trips that are good value. 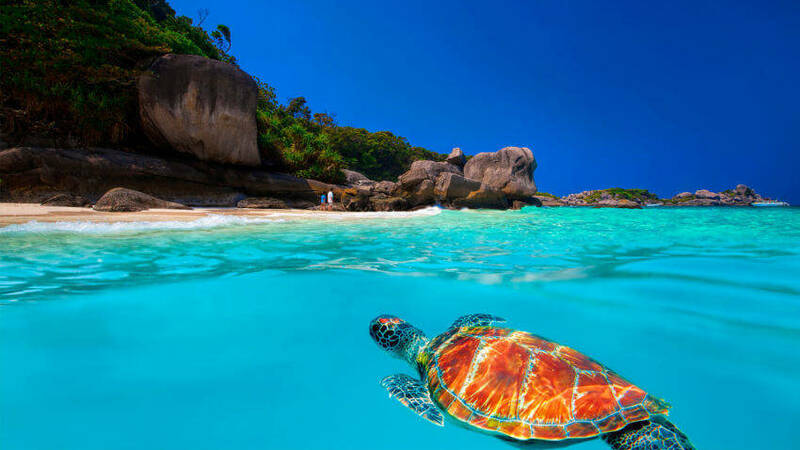 But, if one day is all you have, day trips are possible to the Similan islands National Park. Note that it’s a long trip from Phuket and a higher price than the local day trips. Hotel pick up starts 6am, it’s quite a tiring day trip. This information should give you a good idea of which day trips are available from Phuket, and which trips suit your preferences and budget. If the schedules don’t exactly suit you, or if you are looking for something a bit different, please contact us and we can surely work out something to suit your needs. We are always here to help! If you are already here and want to do some diving, please do call us (+66 84 626 4646) or visit our shop at Karon beach for booking rather than sending a web enquiry which may not be answered immediately. Thanks!